Today marks two months since I saw an orthopedic doctor for the first time. Two days ago was the first time in that period I went back to dancing. I didn’t realize how much I had missed it. Don’t get me wrong – I definitely knew I missed dancing. It was frustrating to be stuck sitting on the sidelines at the weekly blues dance, although it was worth it to see my friends. I hate turning down all the dance events I’m invited to on Facebook. 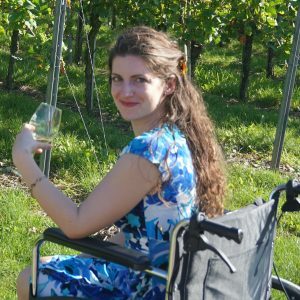 I’m writing this blog post partly because I want to have a record of this experience, and partly because – however well-intentioned – I really don’t enjoy trying over and over to explain how I got injured and what the status of my recovery is. That’s hard to answer. There’s not an interesting story, really. A combination of a tiny accident on top of a lot of activity is my best guess, and the doctors haven’t given me any better insight. In the last year I had become quite the runner, usually logging 30 if not 50 miles per week. This was like a dream come true for me. I had always had problems with my ankles, going back to elementary school when I was constantly falling over from rolled ankles when we were supposed to run laps. It took me a year of regular training to run a mile without stopping. Another year of training got me through a 5k, just barely. It took me 6 years to get to the point where a 10-mile run or even more was possible. 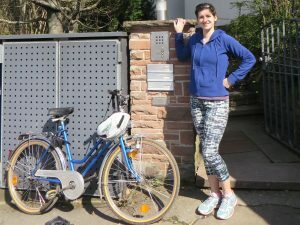 In addition, I was mostly getting around Stuttgart on one of my two bicycles. Plus of course I was dancing blues and kizomba regularly, as well as various other dances less frequently. So, I’d gotten used to lots of activity on a daily basis. On June 1, after the weekly blues dance, I was carrying my bicycle down a flight of stairs in company with other dancers. I fell on the final step. My friends were quick to catch the bike and me, but I twisted both my ankles hard and it hurt. I rode the train home, iced my ankles, and rested three days. I felt fine after that and went back to doing everything, including my longest run to date: 16.5 miles. I might have felt a bit stiff but nothing alarming. A week after my fall, two days after my long run, I went for another run but soon had shooting pains up from my heels behind my ankles, especially bad on the right side. I stopped and made an appointment with a doctor. 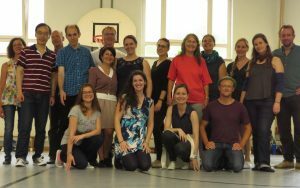 I taught that weekend’s dance workshop about 90% from a seated position. I was in a great deal of pain in spite of frequent icing and stretching. On June 13, an orthopedic doctor told me I had Achilles tendonitis. He also told me that I have a low arch and a protruding bone in the ball of my foot (not news to me!) and that I should have been wearing orthotic insoles for years. Unfortunately he felt that would need to wait now until I was past my injury. At that time, another 6 weeks of inactivity sounded horrifying. The doctor said I could do a bit of biking around and said I should be fine to swim. But after three weeks of trying to take it easy and one session of swimming, I found that I was still in pain daily. I didn’t feel like I was getting any better. I had new pain in the arches of my feet and sometimes on the tops of my feet. My physical therapist said I was probably still doing too much. I found that hard to take. I was already not running and not dancing. My friends had very kindly done ALL the heavy lifting when I needed to move. I’d given up biking except short stretches on flat ground. I was spending more time sitting around than I had since…oh right, my last ankle injury. 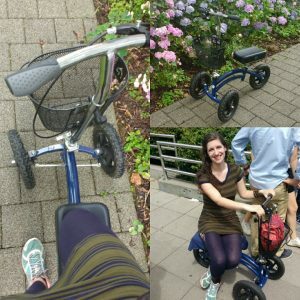 A few days later, I saw an ad for a used “Knee Scooter.” I promptly bought it and used it joyfully over the weekend to run some errands and visit Stuttgart’s Afrika Festival. I went on a little sightseeing excursion and friends helped push me up hills and carried the scooter on steps. I was looking ahead to the end of July, when my parents would be coming for a visit. How would I ever cope? I was supposed to be their tour guide, taking them on excursions for 10 days, and I couldn’t even walk for 15 minutes without reaping hours of pain. I saw a new orthopedic doctor July 31. She did an ultrasound on both ankles. She couldn’t diagnose exactly what the trouble was, but gave me the welcome news that my Achilles tendons were not at all torn. 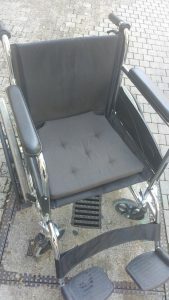 She said I didn’t need a wheelchair, but understood my efforts to do less. I got a matching brace for my left ankle and an appointment for an MRI Aug. 17. Unfortunately the soonest I could get another appointment with the orthopedic doctor was Sept. 5, so a real diagnosis seems a long way off. Since then I’ve done a lot of reading about “Achilles tendonitis.” It turns out that’s a super vague term that could cover a lot of different problems. That explains in part why I feel so confused all the time about what’s going on, in spite of asking lots of questions to the doctors and my former physical therapist. There’s been a lot of “could” and “probably” and “maybe” in their responses. I have a lot of anxiety now about my injury. If it might have just come down to overuse after a tiny accident, how can I be sure that I won’t stay stuck in this injured state because of other small mistakes? Especially when I didn’t feel serious pain while injuring myself, but now feel some level of pain almost always? Should I be sitting like this? Is this putting strain on something? Should I keep trying to avoid inflammation? Or should I be trying to optimize blood flow? Feet elevated or not? Why did my physical therapist only do various kinds of massage, including “mobilization”? Is my current pain really just about holding tension? Should I still be getting for massage now that I have no therapist? Or is my home rolling good enough? Should I massage the arch of my foot or not? Isn’t physical therapy supposed to include exercises? If my prescription was for 6 x Manuelle Therapie and 6 x Krankengymnastik but I only got 6 sessions of massage, should I be complaining? Or am I just unnecessarily mistrustful? Why was I only ever given one home exercise to do? Should I try doing others? When should I use my heating pad and when ice? For how long? On which part of my calves/ankles/feet? Why do my ankles make so many clicking noises now? Why does the pain appear in different places at different times? Why does it sometimes burn, sometimes needle, and sometimes ache? Should I stick to no activity? Or do more walking and dancing to try to build up strength? What are my risks now? What will it take for me to get back to my previous level of activity? Or will that never be possible? I really appreciate that throughout this, my friends in the Stuttgart blues community have been super supportive, doing everything from helping me fix the brakes on my wheelchair or moving me out of my apartment to pushing me up steep hills or just checking in. If I can manage nothing else these next couple of months, I’m excited to be teaching weekly blues dance lessons and seeing these people regularly. It’s been awesome to be offered remote help as well. 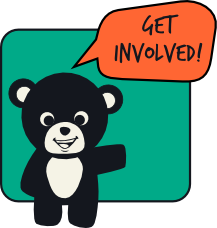 I appreciate those of you who have shared advice from your personal experience or expertise in physical therapy or personal training. Hopefully this post helps explain some of my inconsistent explanations and behaviors since I was injured. I just don’t really know what went wrong or what I should and shouldn’t do or when I can expect to be doing better.